Timothy J. Krueger, St. Martin’s founder and Artistic Director, studied musicology at the Wheaton Conservatory of Music, the University of Colorado, Boulder, the Universität Hamburg, Germany, and the University of London’s Royal Holloway College, where his doctoral dissertation was on the sacred music of Charles Villiers Stanford. He studied conducting with Dr. Paul Wiens and privately with Dennis Keene of the Voices of Ascension. He has sung professionally with the Santa Fe Opera, the Santa Fe Desert Chorale, Chicago A Cappella, the Vox Early Music Ensemble and the Ars Nova Singers, as well as several Episcopal cathedral choirs. 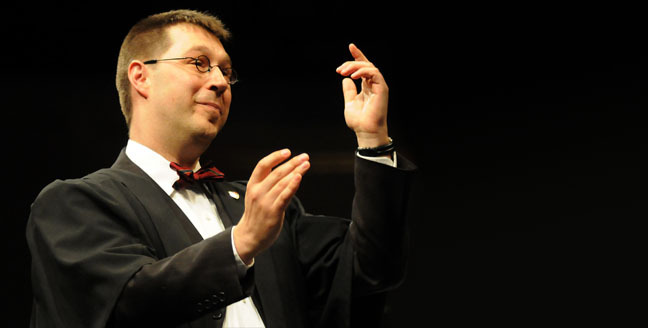 In addition to being the founding Artistic Director of St. Martin’s Chamber Choir, Krueger in the past served as Chorus Director for the Boulder Bach Festival and in a similar capacity for the Colorado Music Festival and the Boulder Philharmonic. He is an Affiliate Faculty member in the Music Department of Metropolitan State University of Denver. He is Choirmaster of St. Andrew’s Episcopal Church, overseeing one of Denver’s finest classical church music programs.